In medium bowl, mix flour and 1/2 teaspoon salt. Cut in shortening, using pastry blender (or pulling 2 table knives through ingredients in opposite directions), until particles are size of small peas. Sprinkle with water, 1 tablespoon at a time, tossing with fork until all flour is moistened and pastry almost leaves side of bowl (1 to 2 teaspoons more water can be added if necessary). Gather pastry into a ball. Shape into flattened round on lightly floured surface. Wrap flattened round of pastry in plastic wrap; refrigerate about 45 minutes or until dough is firm and cold, yet pliable. This allows the shortening to become slightly firm, which helps make the baked pastry more flaky. If refrigerated longer, let pastry soften slightly before rolling. Heat oven to 425°F. Roll pastry on lightly floured surface, using floured rolling pin, into circle 2 inches larger than upside-down 9-inch glass pie plate. Fold pastry into fourths and place in pie plate; unfold pastry and ease into plate, pressing firmly against bottom and side and being careful not to stretch pastry, which will cause it to shrink when baked. Trim overhanging edge of pastry 1 inch from rim of pie plate. Fold and roll pastry under, even with edge of plate; flute. Carefully line pastry with a double thickness of foil, gently pressing foil to bottom and side of pastry. Let foil extend over edge to prevent excessive browning. Bake 10 minutes; carefully remove foil. Bake 2 to 4 minutes longer or until pastry just begins to brown and has become set. If crust bubbles, gently push bubbles down with back of spoon. Reduce oven temperature to 400°F. In medium bowl, beat eggs slightly with wire whisk. Add sugar, 1/4 teaspoon salt, the nutmeg and vanilla; mix well. Gradually blend in hot milk. Pour filling into hot crust (to prevent spilling the filling, place pie plate on oven rack before pouring filling into crust). Cover edge of pie crust with pie crust shield ring or 2- to 3-inch strip of foil to prevent excessive browning; remove shield or foil during last 15 minutes of baking. Bake 25 to 30 minutes or until knife inserted halfway between center and edge comes out clean. Cool on cooling rack 1 hour. Serve slightly warm or cold. Store loosely covered in refrigerator. *If using self-rising flour, omit salt. Pie crusts made with self-rising flour differ in flavor and texture from those made with all-purpose flour. 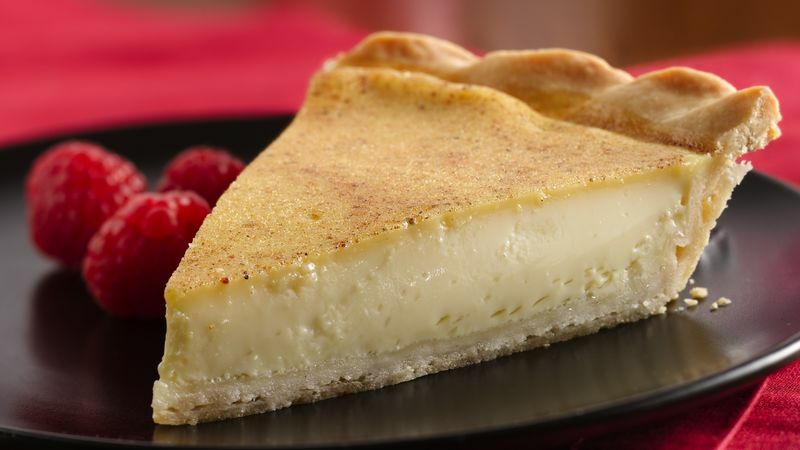 Custard pies get their name from the cooked mixture of egg, milk and cream that fills them. This simple list of ingredients means that making your custard pie sweet or savory is actually quite easy. What’s more challenging is getting your custard filling to set correctly. Overcook the eggy mixture and you end up with scrambled eggs. Undercook it and you’ve got a soupy mess to deal with. But Betty’s got it all figured out. Instead of cooking the custard filling on the stovetop, this recipe allows it to set in the oven. This traditional technique dates back to medieval times and guarantees a smooth and rich custard filling every time. And because we believe a pie is only good as its crust, check out Betty’s tips for making perfect pie curst. Once you’ve eaten the last crumb of your custard pie, find your next pie recipe among Betty’s extensive recipe library.